We’re conveniently located next to LensCrafters. Walk-ins are welcome! Tired of keeping up with having to continually update your eyeglasses prescriptions and the hassle of keeping, cleaning and storing your contacts? If you're looking for the best way to finally get rid of your eyeglasses or contacts once and for all, we're the practice to come to! We are constantly in search of the best and most convenient ways to help you obtain and maintain your best vision, and work closely with some of the best eye surgeons in the area to provide you with state-of-the-art options in LASIK and refractive surgery co-management. Proper co-management includes both pre-op preparation and post-op follow-up to make 100% sure that you are properly prepared and informed about every aspect of your eye surgery, and that you are healing up perfectly and comfortably afterward. LASIK is the most common vision correction surgery that most eye care professionals provide co-management services for. Its quick and relatively painless recovery are leading factors in why many optometrists recommend LASIK eye surgery to their patients that are looking for independence from their eyeglasses or contact lenses. Your eye doctor will set up a pre-op consultation to be sure that LASIK is right for you. If it is determined that LASIK is the right solution to meet your needs, your doctor will be there to answer any questions and concerns you may have about LASIK and will facilitate the scheduling of the surgery itself. During surgery, a small, circular flap is opened in the cornea either with an instrument called a microkeratome or with a laser. The flap is then folded back and a special cool ultraviolet laser is used to gently reshape your cornea. The cornea is reshaped to be flatter to solve nearsightedness, while the cornea is reshaped into a steeper form for farsightedness. The eye surgeon will then set the circular flap of the cornea back in place, and the reshaped cornea should be able to focus incoming light more accurately than before, allowing for noticeably improved eyesight. After your eye surgery, you will return to your optometrist, where follow up appointments will take place with your eye doctor to ensure that your recovery is going as expected and that your eyesight has improved as intended. Any questions you have in terms of post-op recovery will be answered in your first session after surgery, and sight should return within a short period of time, with most patients able to see clearly in just a few days. For more information about LASIK surgery and co-management, speak to your eye care professional today. 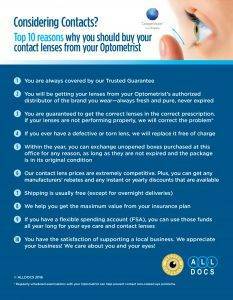 Top 10 Reasons You Should Buy Contacts from Us!